bitter sweet stamping: Trees, trees, trees! Oh, how I love me some tree stamps!! They are so incredibly versatile, and you just never know where they will pop up! A Muse has TWO new tree sets coming out very soon!! Get ready! Here is a sneak peak of one of the new sets! See that fun circle around the sentiment - that's part of a tree!! This particular tree is so much fun to paper piece! Details: A Muse Trees 2 Clear Set (available 9/22/08), A Muse Maderia Notecards in brown and green, A Muse 8.5x11 paper in Maderia blue, A Muse stitched grosgrain ribbon in French Roast, Momento Ink in Rich Cocoa. ADORABLE!!!! Love little squirrel paired with the trees-perfect! Love your tree!! What an awesome card Tisha! This is so cute, Tisha! 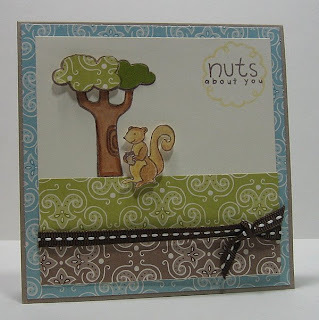 I love the squirrel and the paper pieced tree tops! Darling! These trees are so great, I don't know which I like best!!! How cute is this??!! Love the 3-d tree. Off (or in) to school!